My friend Erin has started a blog, Notty Pea. You’re sure to love it – just like me, she’s crafty and admittedly not a type A personality. Go check it out now and follow it. You won’t be sorry. She’s pretty awesome. I don’t just say that because she could out drink me back in our wild, kid-free days. Speaking of introductions, Edie had no school on Monday, so I let her stay up and watch some Downton Abbey with me. Of course, I crashed out about 10 or so because I cannot stay up past 9:30 without serious caffeine that then keeps me up all night. It’s early or nothing with me. Anyway. She has no such problems. Who needs the internet for spoilers when you have an 11 year old daughter? That’s right, the first thing she told me in the morning was everything I’d missed the night before on Downton Abbey. And she wants to go back and watch the entire show now. There’s a character named Edith don’t ya know. Not a whole lot of Ediths out there, at least that she knows of. So she’s been walking around practicing her British accent, announcing that she wants to live in a manor house. I think she thinks the show is set in the current British country side. She really won’t hear otherwise. I hate to ruin a dream world, so I’m letting it go mostly. Except for the duchess thing. It seems she’d prefer to be called “Duchess” after watching that. I really need to be more on top of her TV watching habits. That’s what is currently on my living room coffee table. Sunday’s NY Times magazine, coasters and a deer jaw she found while going off trail in the woods at the park across the street. Emma is totally into Downton Abbey, and was pretty devastated that they had to kill Micheal off. We're slowly re-watching from the beginning, so we can get forget that annoying ending. 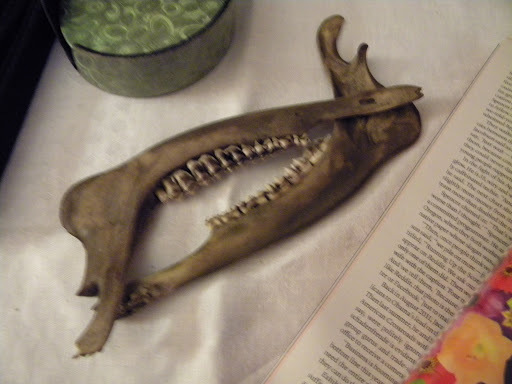 deer jaw,interesting decor! And the British accent stands out in C'ville! I just love Edie's free spirit personality, really a cool kid! Zipping over to check out your friend's blog. Edith is pretty fabulous and who wouldn't want to be called “duchess?” Seriously.